Texas Tech University System Chancellor Tedd L. Mitchell, M.D. 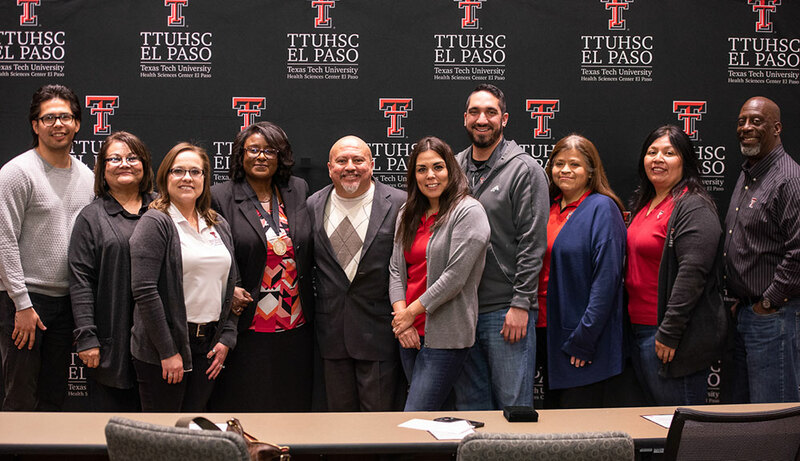 and TTUHSC El Paso President Richard Lange, M.D., presented the annual Chancellor’s Council Distinguished Teaching Award on Friday, Jan. 17, to Charmaine Martin, M.D., an associate professor in the Department of Family and Community Medicine at the Paul L. Foster School of Medicine. The Chancellor’s Council is a giving society that supports Chancellor Mitchell’s priorities of impacting student lives through scholarships, recognizing faculty achievement and encouraging excellence across the TTU System and its four component institutions. The awards are made possible through philanthropic gifts to the Chancellor’s Council. Award recipients each receive a $5,000 stipend and an engraved medallion. Dr. Martin also serves as assistant dean of student affairs at the school of medicine. She has taught at TTUHSC El Paso since 2005. Dr. Charmaine Martin’s colleagues gathered at the Francis Auditorium to celebrate her selection for the Chancellor’s Council Distinguished Teaching Award. Dr. Martin teaches medical students at the Texas Tech Physicians of El Paso Family Medicine Clinic in Northeast El Paso. She also participates in free community health care events around the city throughout the year. Dr. Martin created a program called Scholars in Primary Care, which encourages student interest in primary care by providing opportunities for leadership, patient advocacy and clinical experience. Program participants work with Dr. Martin at a free clinic for migrant farm workers, allowing students to gain hands-on clinical training while serving the community. The clinic received 120 office visits from migrants last year. Last November, Dr. Martin was awarded the Texas Academy of Family Physicians Full-Time Faculty Exemplary Teaching Award during TAFP’s Annual Session and Primary Care Summit. The award honors individuals with outstanding teaching skills and those who have developed and implemented innovative teaching models.